True analogue delay with expressive control possibilities. 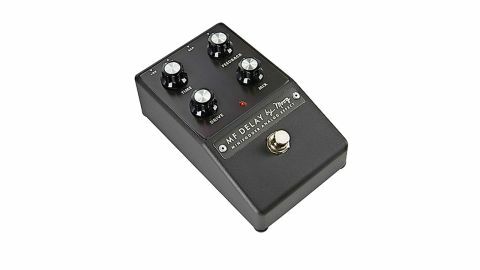 Another versatile MF pedal. Expression pedal input. Drive options. Natural sound. It's the most expensive of the Minifooger range. A true analogue delay, like the Moogerfooger MF-104 variants, Moog's Minifooger Delay features four BBD chips, allowing delay times of up to 700ms. "Repeats are not massively different from the dry sound; the result is a natural sound that blends smoothly in"
How different manufacturers set up the sound of the repeats varies greatly in this type of delay pedal, and Moog has come up with repeats that are definitely analogue in the way they decay, but are not massively different from the dry sound; the result is a natural sound that blends smoothly in. We get delay time and feedback controls, a 100 per cent dry to 100 per cent wet mix knob, plus a drive control with 22dB available for some boost or tonal colouring. You can connect an expression pedal assigned to control time or feedback, the former offering some strange effects, the latter adding repeats as you need them or controlling the take-off into self-oscillation. There are many analogue delays, but the expression-pedal input and drive knob make the MF one of the most versatile.